This handy kit enables you to safety wire any nuts or bolts on an airframe or engine. Just place the special washers under the bolt or nut, bend up the small flanges to hold the bolt or nut in place, and then use the tab of the washer to attach the wire to a solid point so the bolt cannot move. 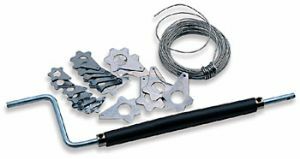 This kit works on the same principle as drilled bolts do and is very handy for those flying with an engine that does not have safety wired nuts and bolts. Excellent for use on two stroke engines.